Tune your piano regularly, twice a year, summer/winter or fall/spring. That is when the barometric pressure patterns and humidity levels are most similar and regular--and can impact the long term steadiness of your instrument. Pianos are mechanical wonders with in excess of 8,000 moving parts in it. Therefore, a full regulation should be done every 2 to 5 years. In essence a piano requires the same regularity of maintenance that a car or A/C unit does. Refrain from any do-it-yourself urges. Musical instruments, of all kinds, are carefully calibrated and their repairs should ONLY be undertaken by trained and degreed professional technicians. 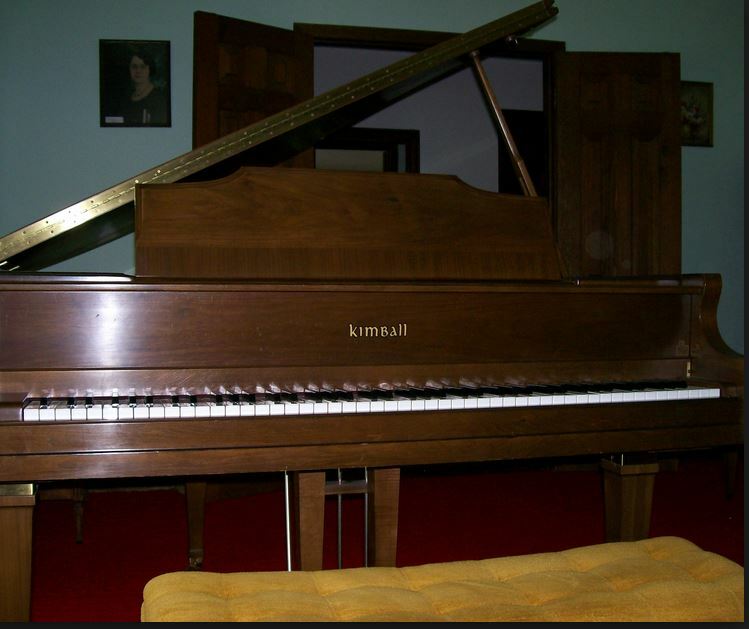 What may appear to an owner as a simple fix can lead to irrevocable damage to your piano if not done correctly. Keep your piano away from space heaters, heating registers, radiators, fireplaces, air conditioning vents, open doors and windows. Subjecting it to extreme fluctuations of temperature and humidity levels can do major damage. Today's home construction kills the old adage: "Keep a piano away from an outside wall". Do not expose your piano to direct sunlight as this will damage and fade the finish, or even cause strings to break. On a grand piano, keeping the lid flap folded over the remaining lid will invariably cause discoloration on the area covered by the lid flap. The degree of discoloration will depend on the intensity of the UV rays. Hydrostatic conditions will greatly impact your piano's well-being. Pianos should be kept at a constant 45% humidity. Your piano's number one enemy is fluctuations in temperature and humidity. Keep small children away from an instrument. A 3-year old will quickly perceive a piano as a percussion instrument and bang away on it with fists. The damage that can result from this can be substantial to your pocket book. Keep any liquid, plants, vases, drinks, ashtrays, food away from your piano. Even a small amount of condensation can cause irreversible damage. The only 3 items, in addition to music scores, that should be on a piano are: a pencil, an eraser and a metronome (if you use one). To clean your instrument, feather-dust the piano first (dust is abrasive, so wiping it first can cause scratches), then wipe with a soft, damp cotton cloth. Always wipe in the direction of the grain. Then, wipe up any excess moisture with a similar dry cloth. Do the same thing as above to clean your keys, or just a small amount of all-purpose Windex. The cloth should not be soaked with Windex, but just slightly damp. 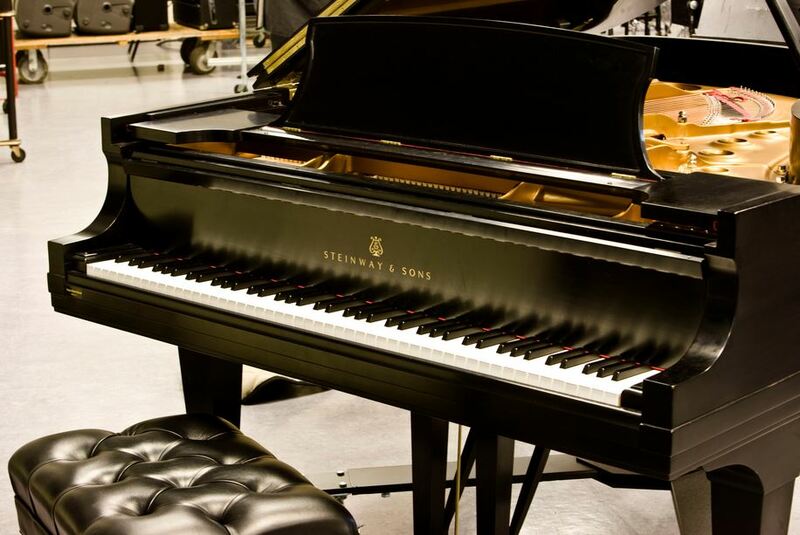 Professional piano technicians use industry specific cleaning agents, both for keys and finishes. They are costly, but will greatly enhance your instrument's luster. Do not touch piano strings with your fingers. Oil and skin moisture will cause oxidation. Use brass polish (Brand: Brasso) to clean the pedals. 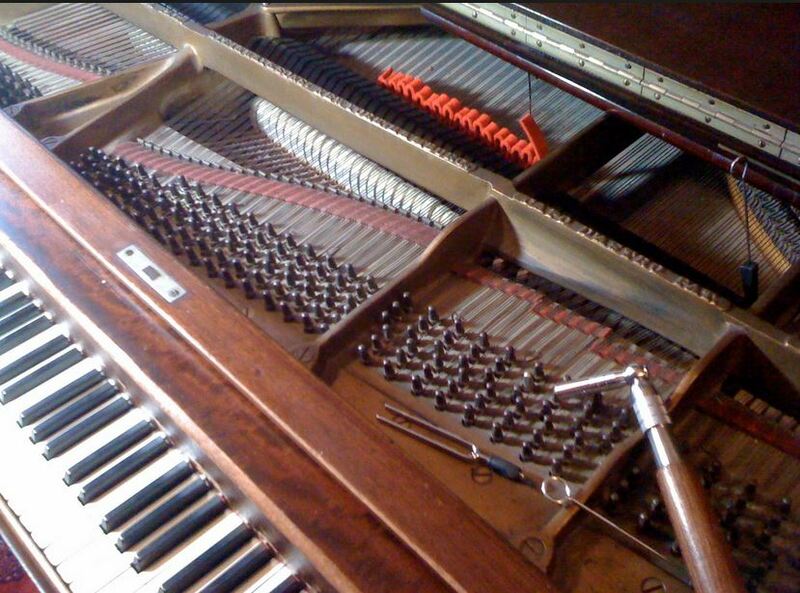 If you have a grand piano, do not attempt to clean the inside, neither the soundboard nor the strings. This should only be done by a certified technician.